There are two classes of medications commonly used to treat some lung diseases. These often treat symptoms associated with COPD and other breathing problems: bronchodilators and steroids. 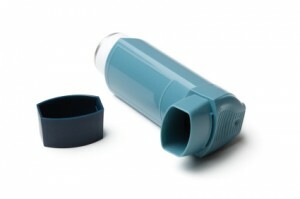 Asthma patients also use these to combat acute and long-term symptoms. Both types of breathing treatments are used to help you breathe better, but they work in very different ways. For the most part, these drugs are either given “as needed” to relieve acute symptoms temporarily, or more regularly for persistent problems breathing. Think of these drugs as a muscle relaxant that works on your airways. You have muscles in your chest that affect the diameter and rigidity of your breathing tubes, so by relaxing them you will be able to breathe easier and deeper. There are three kinds of bronchodilators, and your doctor will prescribe the best one for your situation. 1. Beta2 Antagonists: These can be taken as a pill or more commonly inhaled for faster results. Some work very fast, while others can take 20 minutes to kick in. Fast-acting formulations are perfect to use before an activity that may cause you difficulty in breathing. There are also 12-hour formulations that are taken twice a day to manage conditions like COPD around the clock. Speak with your doctor about side effects for the particular medication you are taking. Xopenex (levalbuterol) and Proventil (albuterol) are two kinds of beta2 antagonists. 2. Anticholinergics: These types of bronchodilators are inhaled only, and can be short or long lasting. An important thing to note with these kinds of medications is that they do not work as quickly as beta2 antagonists, so they are not to be used for acute symptoms. They do have fewer side effects, however, and you may be prescribed an anticholinergic and a beta2 antagonist together to combat your symptoms as effectively as possible for any given situation. Atrovent and Spiriva are two brands of anticholinergics. 3. Theophylline: This is an older class of medication that is not in use as much anymore for people suffering from COPD. Taken in pill form, there are also short and long lasting formulations of theophylline, but no fast acting formula. Your doctor will have to monitor the levels of the drug in your blood very carefully, because serious side effects can occur if those levels get too high. Your doctor will go over these side effects with you and, as with any medications, you should seek medical advice immediately if you encounter any problems. Truxophyllin and Theolair are two kinds of theophylline. Regular treatment with steroids is for patients with more severe and persistent COPD and Asthma symptoms. These medications are used to reduce swelling in your airways so you can breath better. These kinds of steroids (corticosteroids) are different than the kind you hear about in professional sports (anabolic steroids). These kinds of medications come in both oral (pill) and inhaled form, and work slowly and in smaller doses so that side effects can be avoided. It takes time to notice any positive changes when using corticosteroids for COPD. Oftentimes, your doctor will also prescribe a bronchodilator with a steroid for a more complete “combination” approach to treating your breathing problems. Becotide and Pulmicort are two kinds of steroids used to treat COPD. Many COPD patients experience swelling and fluid retention, particularly in the ankles. If you also suffer from heart failure, fluid can collect in the lungs as well. This tends to happen during bouts with acute bronchitis. Since steroid treatments can actually cause fluid retention, often you will be prescribed a diuretic to help your kidneys get rid of these excess fluids. Lasix and Aldactone are two brands of diuretics that you may be given to help you breathe better. In some cases, you may be prescribed antibiotic breathing treatment to deal with an acute bacterial infection that results in severe symptoms of chronic bronchitis. Note that antibiotics only work for these kinds of infections, and not for viral infections. These are the same kinds of antibiotics you have probably taken before. Antibiotics are not effective for treating symptoms of COPD over a long-term period of time. Commonly used brands include Augmentin, Zithromax, and Avelox. 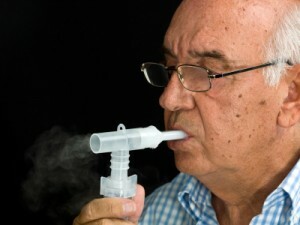 People who suffer from asthma use many of the same bronchodilators and corticosteroids as people who suffer from COPD. However there are some other kinds of medications available to asthma patients, depending on how severe your breathing difficulties are. 1. Leukotriene Inhibitors: These drugs are often used in combination with an inhaled steroid in order to avoid using an oral steroid. They work by blocking the chemicals that your body generates when it is exposed to something that triggers your asthma, resulting in fewer attacks. Singulair is one common leukotriene inhibitor. 2. Monoclonal Antibodies: This is the newest kind of asthma medicine, and is used in more severe cases where inhaled steroids are not sufficient. This kind of breathing treatment is injected intravenously, and works by reducing the amount of allergy-causing chemicals released by the body when it comes into contact with a trigger substance. Xolair is currently the only drug in this category. 3. Mast Cell Inhibitors: These mild drugs prevent the symptoms of allergies, such as runny nose and itchy eyes, as well as asthmatic reactions to allergies. Mostly used seasonally for people with milder asthma, these work by blocking the release of histamine in your body. Intal and Tilade are two kinds of mast cell inhibitors. For Cystic Fibrosis patients, or some COPD patients where excess mucus production is a major problem, your doctor may prescribe mucus-thinning medications called mucloytics. These make the excess mucus less sticky and easier to expel, thus helping you to breathe better. These come in tablet or liquid form. Many people have allergic reactions to these products, so speak with your doctor thoroughly before trying these products. Mucomyst is one kind of mucolytic medicine currently on the market. For people using inhaled bronchodilators and steroids to treat their lung disorder, there are two primary devices used to administer the medicine. One is an inhaler, very common for asthma patients and very easy to use. The other is a nebulizer, used in conjuction with liquid formulations of certain kinds of medication. Nebulizers: These machines deliver liquid medicine to your lungs and airways in the form of a mist. By forcing air through the liquid, the medicine is broken up and propelled into your lungs. You will need to wear a mask or mouthpiece to use this device.